Palmer, Alaska on August 17th-21st, 2013. 3) Identify regional impacts, key issues, research needs, policy positions, and next steps concerning fossil fuel, mining and climate change with emphasis for Alaska Natives. We will cover topics such as: Media 101, Legal 101, Oil and Gas 101, Coal 101, Mining 101, Renewable Energy 101, Climate Justice 101, Non-Violent Direct Action 101 and Decolonization 101. 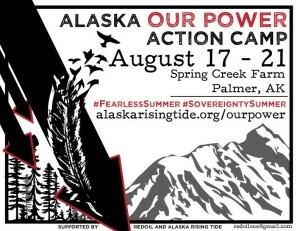 REDOIL and Rising Tide AK would like to bring in participants from frontline fossil fuel, mining and climate change impacted communities from throughout Alaska.